The Bloomington Knockers would like to say, thank you to every one of the players/cheer on another sucessfull season. It was our pleasure to be able to teach and coach all of you this season. And thanks to all the parents for giving us the opportunity to be a part of your childrens life. Hopefully we were able to give them the tools to move on to the next year. The Bloomington Knockers . 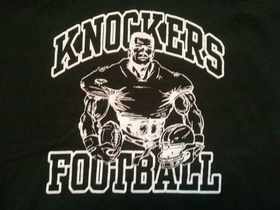 . .
“We played with KNOCKER PRIDE." We have been prepared for our future as individuals and as a team. Founded in 1957 by Paul and Barb Segobiano.